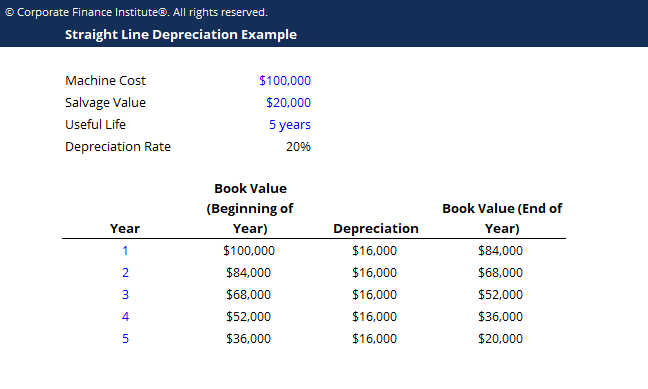 This straight line depreciation template demonstrates how to calculate depreciation expense using the straight line depreciation method. With the straight line depreciation method, the value of an asset is reduced uniformly over each period until it reaches its salvage valueSalvage ValueSalvage value is the estimated amount that an asset is worth at the end of its useful life. Salvage value is also known as scrap value or residual value, and is used in calculating depreciation expense. The value depends on how long the company expects to use the asset and how hard the asset is used. For example, if a. Straight line depreciation is the most commonly used and straightforward depreciation methodDepreciation ExpenseDepreciation expense is used to reduce the value of plant, property, and equipment to match its use, and wear and tear over time. Depreciation expense is used to better match the expense of a long-term asset to the revenue it generates. for allocating the cost of an assetIntangible AssetsAccording to the IFRS, intangible assets are identifiable, non-monetary assets without physical substance. Like all assets, intangible assets are those that are expected to generate economic returns for the company in the future. As a long-term asset, this expectation extends for more than one year. It is calculated by dividing the cost by the useful life of the asset.